The gentleman seen in this cabinet card photograph possesses a fine beard. Although I have seen his beard style in other cabinet card images, it still is an uncommon beard style for the time. The beard is very thick on each side but sparse in the middle. It has a similar appearance as a bushy mustache. 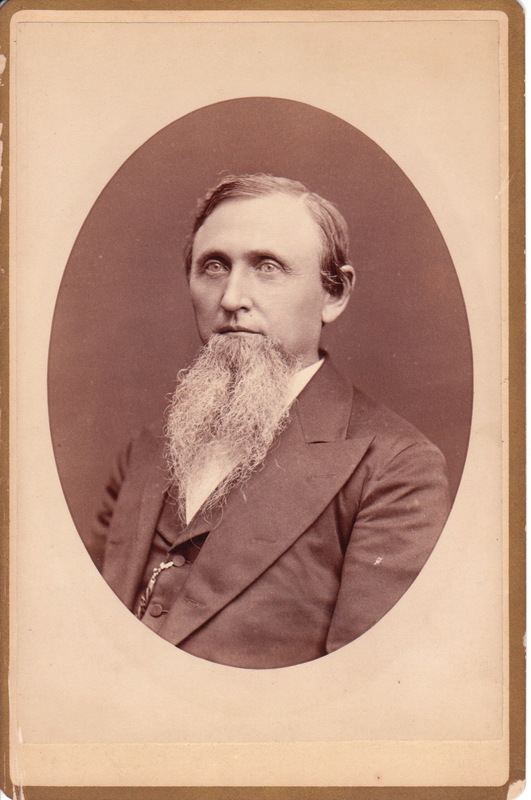 This gentleman and his beard have earned a place in the Cabinet Card Gallery’s category of “Beards (Only the Best). The subject of this photograph is well dressed in a three piece suit and is wearing a pocket watch attached to one of the buttons on his vest. The photographer of this cabinet card portrait was employed by the Johns & Faught studio in Lexington, Kentucky. In the book “History of Fayette County, Kentucky” (1882), it is stated that W. E. Johns was born in Lexington in 1843. He began his photography business in Lexington in 1870 and by 1876 opened a new studio at the address (56 East Main Street), which was where he photographed this cabinet card. By at least 1886, James Faught worked for Johns as an operator in his studio. At a later date, the pair became partners in the business. To view other photographs by this studio, click on the category “Photographer: Johns & Faught”. This cabinet card has excellent clarity and is in very good condition (see scans).